We are always in need of more fosters. 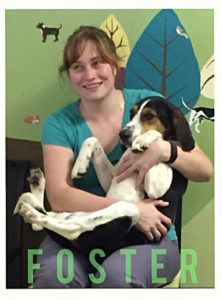 Since we don’t have a physical shelter, we rely on foster homes to house our adoptable animals. We have hundreds of rescue pets adopted from us every year & not a single one would have been possible without our wonderful fosters! The more fosters we have, the more animals we can help. Saturdays are our busiest day & are when we normally ask our fosters to bring their foster animal into the store for scheduled meets with adopters. If a foster is available to drop a dog/cat off at our Peppermint Pig Thrift and Gift store on most Saturdays, that is helpful for scheduling approved meets. We usually schedule a meet sometime between 12 and 4 but the foster just needs to drop their foster off during that time and our rescue volunteers will handle the rest. Fosters are welcome to drop the dog/cat they are fostering at our thrift store every Saturday 12-4 (even if an approved adopter hasn’t been scheduled for a meet) or during our open store hours on TUESDAY, WEDNESDAY, or FRIDAY 11-4:30 & Saturday 12-4) to get the dog/cat some more visibility, but it’s not required. We try to pair you with a dog that fits your current household (other animals, family members, schedule) & what you are looking to foster. We get calls daily from the county shelters asking us to take dogs & from owners in difficult situations looking to surrender their dogs to us so it’s always good to have options. Whether you are an established foster or a brand new one, we always ask you first if you are available and willing to foster a particular dog. Some fosters choose to continuously have a dog in foster while others take one, then when it gets adopted they take a break for a bit. We respect whatever way you’d like to foster. The great part is that if a particular dog is not a good fit, then we will move that dog to another foster (if possible) or if one isn’t available we will pay boarding expenses for that dog. We also will board the foster dog if you have to travel during any of the time that a foster dog remains with you. We’d love if you could commit to fostering a particular dog or cat until they find their forever home but any amount of time you can give us helps us learn more about our animals and reduces the time that they could potentially spend in boarding. We have many dogs that are adopted as quickly as the day we get them back from all of their vetting & many more that are adopted within the week. It’s rare for a dog to be around for more than 2 months. We utilize our WEBSITE, our very active FACEBOOK page, and PETFINDER, and we place scrolling frames and books in our Peppermint Pig Thrift and Gift store to advertise our available rescue animals. Inquiries from potential adopters are answered immediately so our dogs have the opportunity to go to a suitable forever home as soon as possible. This is not only beneficial for the dog/cat but it also minimizes the time spent in a foster home. We supply the dog food for our fosters if you’d like to use it (Diamond Naturals Lamb & Rice) and any crates or supplies you need for your foster. In most cases we have fully vetted the animals (vaccinations, flea/heartworm treatment, dewormer) before they come to you, except in the case of puppies who receive their vaccinations (at our store location) at 8, 12, and 16 weeks and will be spayed/neutered when old enough. Occasionally we ask for a foster’s help in dropping their foster dog off at our approved vet for a spay or neuter (on our account and at our expense, of course). All vet care and monthly flea/heartworm prevention is provided for the foster dog while in the foster’s care. We often don’t know very much about a dog when we get it other than if it’s sweet, so housebreaking & crate training is usually unknown until they go to the foster’s home. 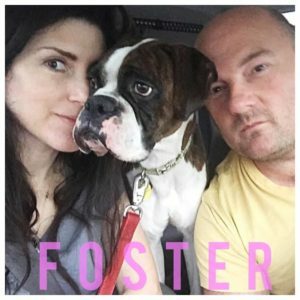 We look to our fosters to help us learn more about our adoptable dogs & what forever home would be best for them. 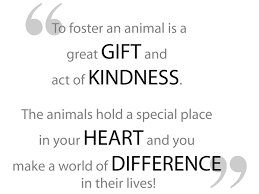 We rely on our foster’s to communicate any behavior or health concerns regarding their foster animal ASAP so we can address them in a timely manner and provide support, counsel, vet care or transfer of the animal to another foster home, if warranted. We connect you with other fosters and with one of our volunteers for support and welcome any pictures and updates you’d like to provide to us (pparescue@gmail.com or to our Peppermint Pig Animal Rescue Facebook foster page ) that will help us find a forever home for your foster. We always say if you supply the love, we’ll supply everything else you may need.